MamaEatsClean: Chocolate Pumpkin Mini Muffins - Vegan, Gluten and Nut Free - And Kid Approved! They Loved these! 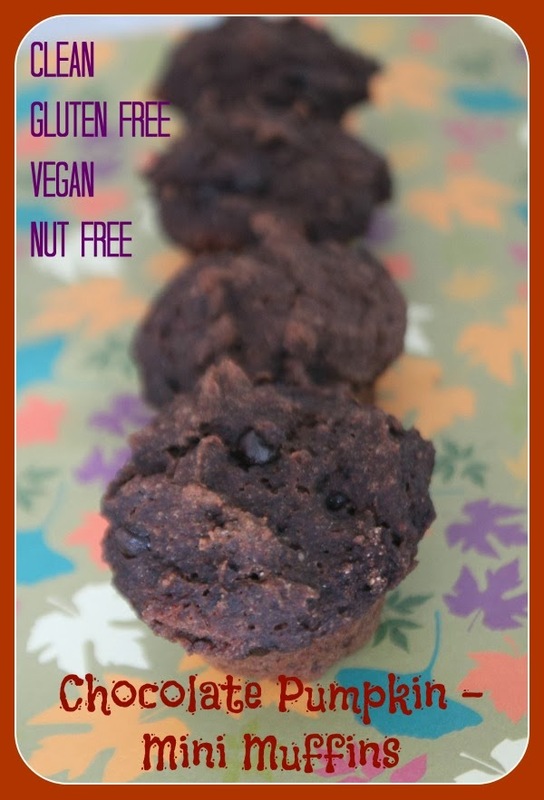 Chocolate Pumpkin Mini Muffins - Vegan, Gluten and Nut Free - And Kid Approved! They Loved these! A recipe for my girls..............don't eat these if you are on the Candida diet. But if you have kids and need some gluten, dairy and egg free snacks then give these a try. My girls both loved them! Have a great Friday and Happy Thanksgiving! Combine Chia gel and water. Let stand 5 minutes. Add Chia gel to wet ingredients and mix thoroughly. Add wet ingredients and chocolate chips to dry ingredients. Mix until just combined. Separate batter into 24 greased mini muffin tins. I used coconut oil. Bake for 28 minutes or until a knife in the center comes out clean.